I am obsessed with the spring this year. I cannot wait until the snow melts and I can see the beginnings of flowers fighting through the surface of their beds. I will warn you now, that I will be showering you with spring decor for the next little while. Yes, there is still snow on the ground here where I live. 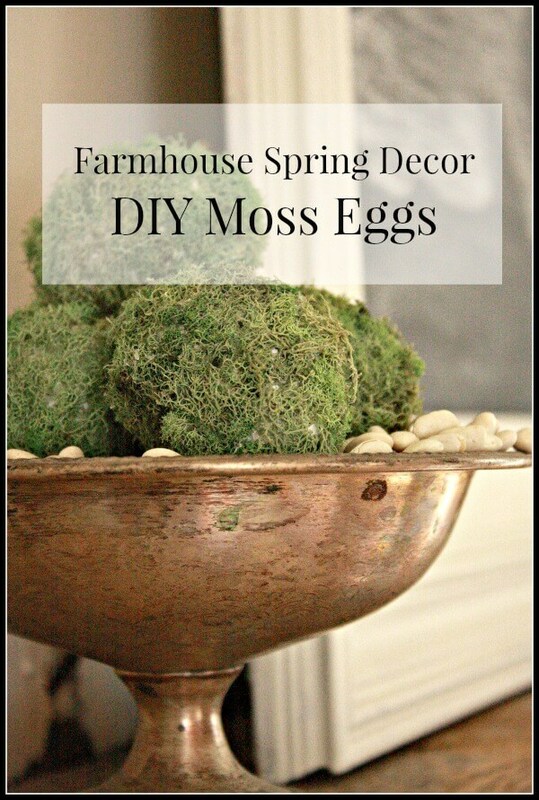 Today I am bringing you a little farmhouse spring decor- DIY moss eggs. Moss eggs? Yes. These were so fun to make. My kids all wanted to participate in the beginning stages of this project. Why you ask? Well, we used real eggs, that they got to blow out the yolk and egg white. Even my 4 year old did one all by herself! It may have taken about 10 minutes, but boy was she proud! You will also need some newspaper and a sewing needle. 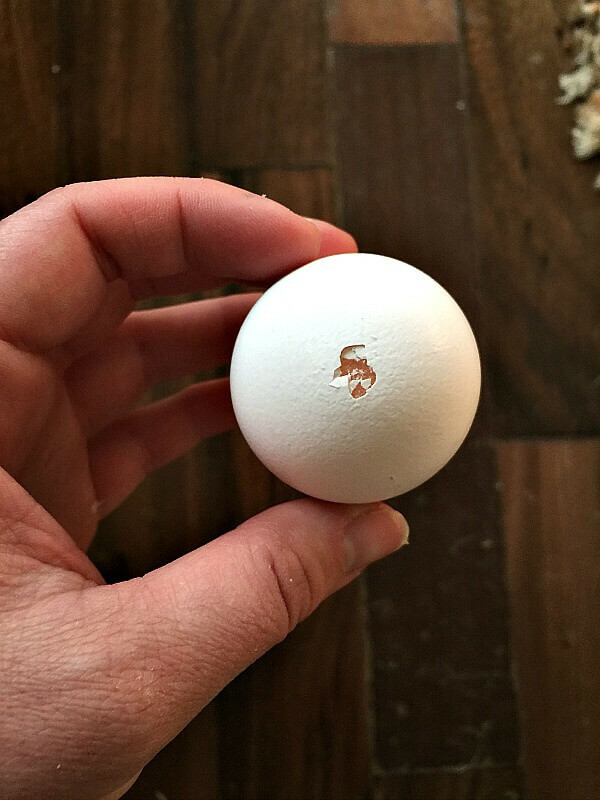 What I did to blow out the egg was to stick the needle into the end of the egg. I then poked it a few more times carefully to open up and make it slightly larger hole. I then did the same thing to the other end of the egg. If you want it to look prettier, you can start by poking a small hole with the needle, and then you can use a small drill bit on a screwdriver to drill a small hole. this takes more finesse but it works quite well. I have done it both ways, but since this was going to be completely covered in moss, it didn’t make much of a difference. Next you want to hire your children to blow the insides out. 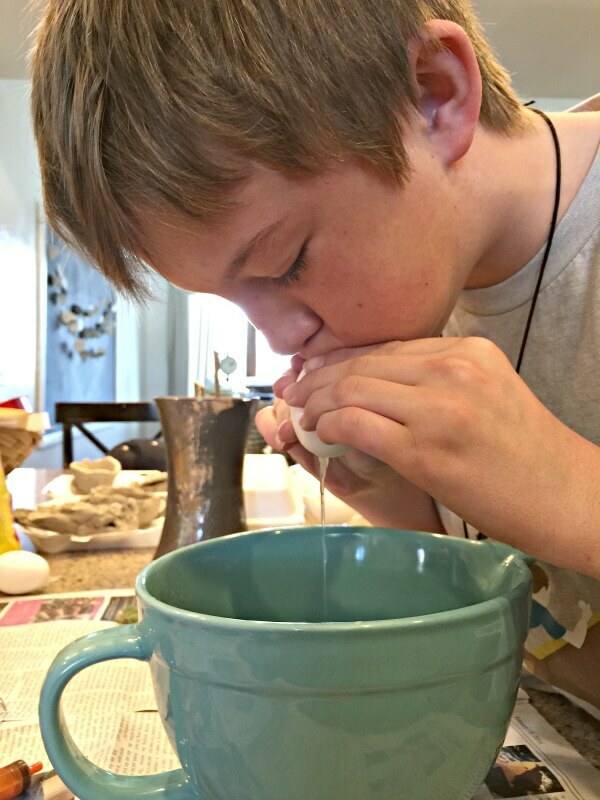 Here’s my boy blowing the egg whites and yolks out. He had a great time doing it for me. Once you have all the eggs emptied out, I let them dry for about an hour. While you are waiting you can grab your other supplies. 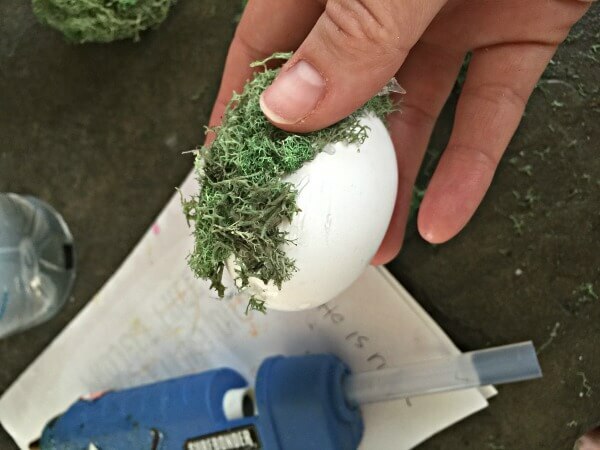 The moss will come in clumps so I like to take the moss and pull it apart, separating it as much as possible so that it will go on the eggs easier. 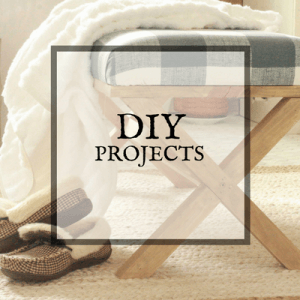 Plug that hot glue gun in. Lay out some newspaper. Watch a little Cougar Town. What? Is that just me? Sorry. I start by applying the hot glue in small batches so that you can control where you are working. Work the moss a little to make it lay a little smoother. 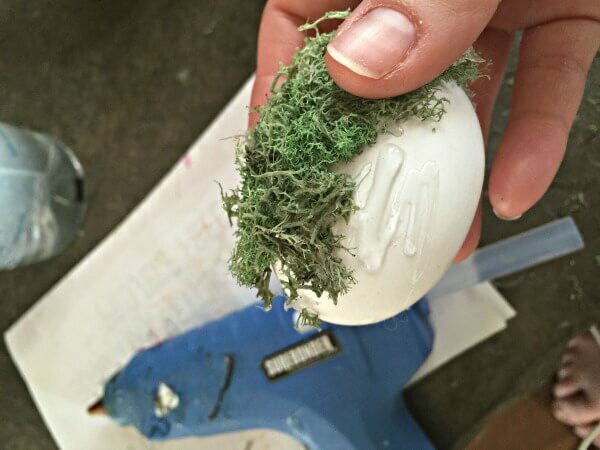 Apply the moss to the hot glue and make sure that you are covering the egg completely. Keep working around the egg until you have covered the entire area. I made 6 eggs and had tons of moss leftover that I used to make another project, that I will feature in a few days. 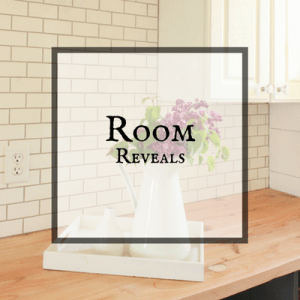 Remember, I told you that I was going to be showering you with spring decor! A helpful hint for these moss eggs. Just remember to be gentle with them. They are after all real eggs. ***If you do not want to use real eggs, use the fake plastic eggs that you use for Easter! You can superglue them together and no one will ever know. Sadly, I think on one of my cleaning binges, I might have accidentally thrown my away. Do not despair though, the egg whites and yolks were used to feed my kids. You can always feed them you your cat or dog as well…it gives them a shiny coat. 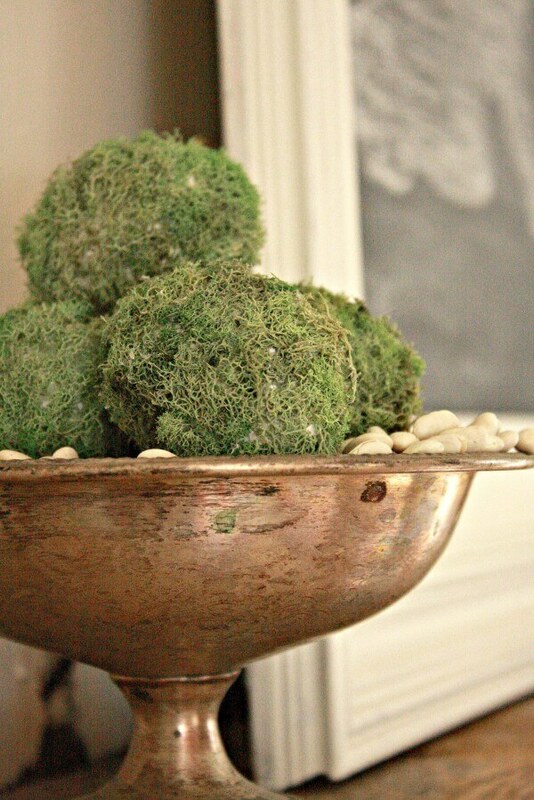 I filled a thrift store pewter bowl with white beans and then added my DIY moss eggs on top. I think they are a great little touch for spring. I. Love. Them. Until tomorrow, have a great day and remember…. Thanks Amber Jane! Thanks for stopping by! Oh, they turned out wonderfully- great job!! 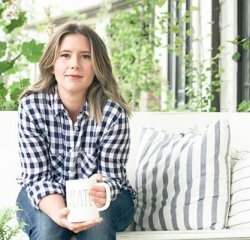 Thanks for linking this up to Talk of the Town! These are too cute! I love that you blew out the eggs to use as your forms. Such a great idea. 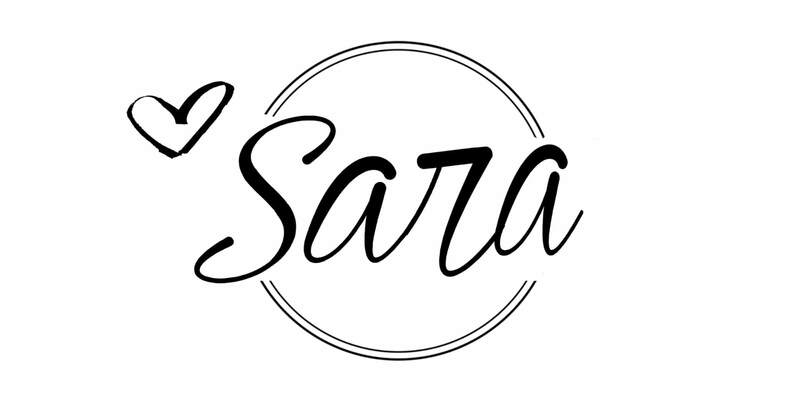 Thanks for sharing at Your Inspired Design!! Thanks Holly! It really was such a fun project! Thank you Pili! My kids loved helping me! especially blowing out the eggs! I love your moss eggs, I have some of those craft eggs and they would be perfect. I never realized how easy these are. And delicate. I have always seen them with styrofoam. Pinned and shared. Thanks for linking up at #ThursdayFavoriteThings! 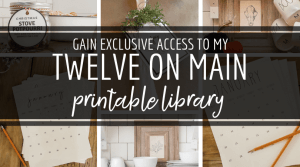 I hope you will join me at #OverTheMoon! 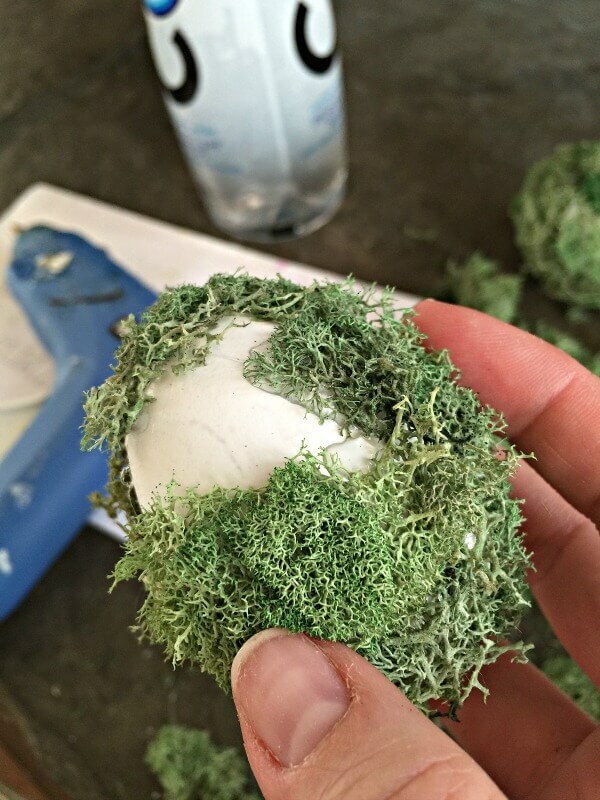 I have seen DIY moss eggs before, but never actually using real eggs before. What a great idea! Thanks for sharing! Thank you Aj! I thought it would be fun to use real eggs. It was great for my budget as well! Oh, I love these eggs! So fun that the kids got to help with the blowing of the eggs. They turned out perfectly “spring-y”! Thank you Jenny! This kids had the best time. Thanks for stopping by! I think they are fabulous! I love this idea.